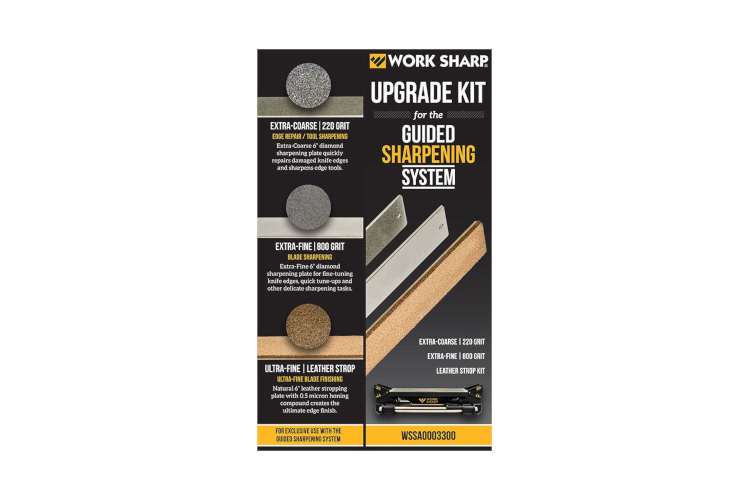 This upgrade kit enables you to expand your Guided Sharpening System to repair damaged blades and sharpen a wider range of tools. The kit includes two additional diamond plates, a leather stropping plate, two 25° Stropping angle guides, and a 0.5 micron honing compound. The 220 grit, extra coarse diamond plate is ideal for quickly removing material so you can repair or re-profile a knife, while the 800 grit, extra fine diamond plate is ideal for re-sharpening a blade. The leather strop is the final step of refining the edge of a blade and is designed to created the sharpest edge possible. Combine the leather and honing compound to produce an extremely keen edge for high performance cutting.